EURUSD is under the influence of economic reports in Euro zone such as: French consumer prices, the inflation rate in Italy, the Germany unemployment rate and the Germany manufacturing PMI. 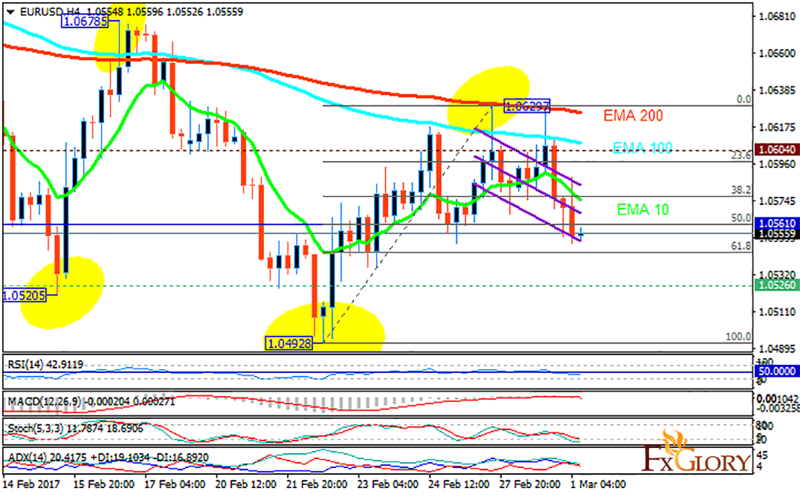 The support rests at 1.05260 with resistance at 1.06040 which the weekly pivot point at 1.05610 is located in between the lines. The EMA of 10 is moving with bearish bias and it is below the EMA of 100 and 200. The RSI is moving horizontally below the 50 level, the Stochastic is moving in low ranges and the MACD indicator is in neutral territory. The ADX is not showing any clear signals. The pair has almost reached the 61.8 level of Fibonacci retracement therefore it will start its correction pattern targeting 1.0630.